While there are many gloves that are famous for what they caught, there is only one in the history of the game that is famous for what it DIDN'T catch. 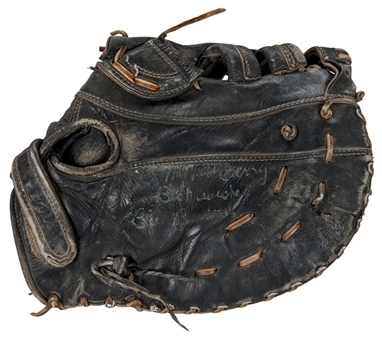 This is the first baseman's glove worn by Bill Buckner in Game 6 - yes, THAT Game 6 - as in the 1986 World Series. To recap, the Mets and Red Sox had battled it out for five hard-fought games. The Sox went into Game 6 at Shea Stadium up three games to two and were winning 3-2 going into the bottom of the 8th. Then the magic started to happen. Reliever Calvin Schiraldi gave up a single to Lee Mazzilli and then Dykstra beat out a sacrifice bunt. Wally Backman's sacrifice bunt moved the runners to second and third and an intentional walk to Keith Hernandez loaded the bases. Gary Carter hit a long fly ball to deep left field that was caught for an out but Mazzilli tagged up to tie the game. Strawberry flied out to end the inning, but the game was now tied at 3. Rick Aguilera pitched out of some trouble in Boston's 9th to keep the game even while Schiraldi did the same. In the 10th inning, Dave Henderson hit Aguilera's first pitch into the stands to make it 4-3 Boston and then Boggs doubled and scored a single by Marty Barrett. Barrett went to second when the ball was thrown home. That brought up Boston's first baseman, Bill Buckner. 1986 was Buckner's 17th season in the Majors. Buckner had long suffered from chronic ankle problems and wore special Nike hightop cleats to relieve the pressure and give support. Typically, by this late in the game Boston's manager John McNamara would have taken him out, but had decided to keep his veteran first baseman in so he could be there when Boston won the championship. Now batting in the 9th he was hit by a Rick Aguilera pitch. With two runners on, Jim Rice flied out to end the inning. But the damage was done. The score was now 5-3 and Boston was three outs away from their first World Championship since 1918. For the bottom of the 10th, Calvin Schiraldi was facing the bottom of New York's line up - Backman, Hernandez and Carter. Schiraldi got Backman to fly out to left and Hernandez hit an easy fly to center that was hauled in. Now Boston one out away from the Championship. Keith Hernandez retreated into the clubhouse and a miss-cue by the scoreboard operator sent "Congratulations Boston Red Sox, 1986 World Champions" flashing on the scoreboard. Now it was up to Gary Carter to keep his team alive. As he did all season, "The Kid" reached deep down and came through - this time in the form of a single to left. Kevin Mitchell was brought out of the clubhouse where he was booking a flight home to the West coast - and sent up to pinch hit. He singled. This brought up Ray Knight. The scrappy third baseman took two quick strikes. Now Boston was one strike away… and Knight singled, scoring Carter and advancing Mitchell to third. Now it was a one-run game. With Mookie Wilson in the on deck circle, McNamara went to the bullpen and brought in Bob Stanley. Mookie took strikes and fouled off pitches for what seemed like an eternity. Boston was again one strike away from the Championship when the ball got away from Stanley. Kevin Mitchell raced home as Boston's catcher tried to regain control of the ball. Now the game was tied. With Mookie fouling off one pitch after another and Ray Knight dancing off second base, the Shea Stadium crowd was going insane. Finally Mookie connected - and hit a grounder down the first baseline for what should have been the last out. 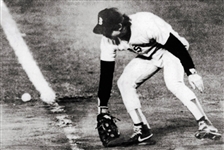 Bill Buckner was playing on the grass and moved over behind the bag, bringing his glove down to field the ball - but in what seemed like a cruel slight-of-hand trick, the ball somehow eluded Buckner's glove and rolled through his high-topped ankles and into right field. Buckner straightened up looked on helplessly as Ray Knight raced home with the winning run. This is THE GLOVE. The MacGregor Bill Buckner Professional Model first baseman's glove shows heavy game wear with a layer of steerhide missing from its pocket. 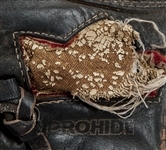 The frayed and semi-detached MacGregor "crown" label dates it to a 1979-1983 manufacturing date. 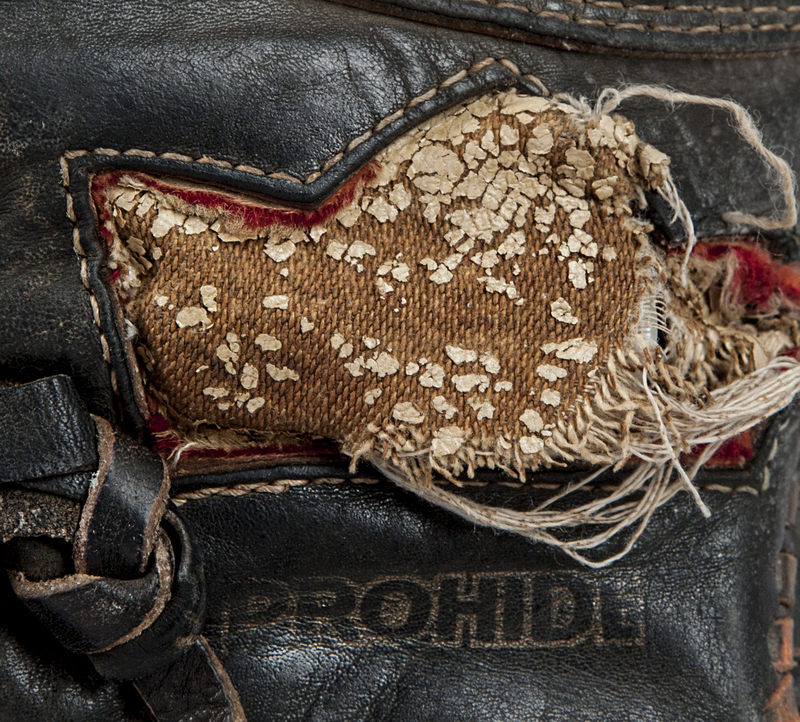 Excessive scuffing is seen on the fingertips, heel and body of the glove. 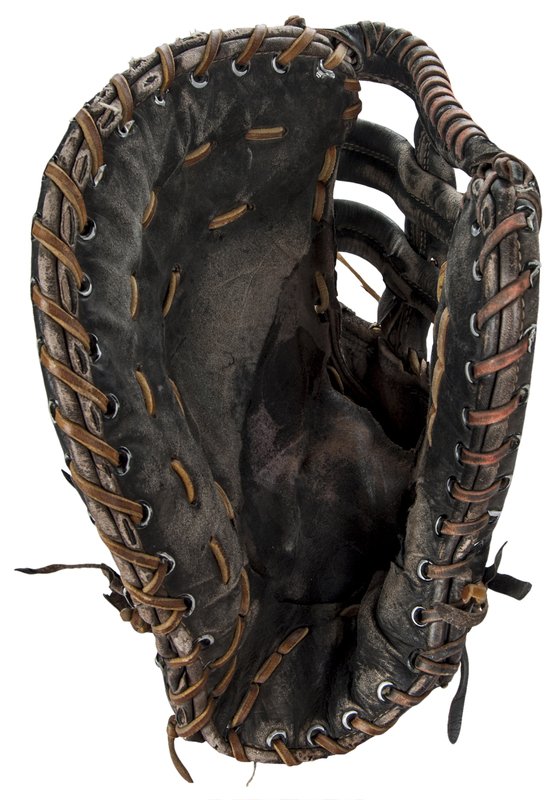 The black "Prohide" steerhide leather glove is bound with contrasting tanned rawhide lacing. The glove features the single post triple T-bat web with a closed back made adjustable with a Velcro wrist strap. The glove was gifted by Buckner to famed collector Barry Halper, and the back of the fingers are signed "To My Pal Barry, Best Wishes Bill Buckner". 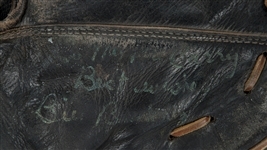 The glove was featured in the 1999 Sotheby's auction of the Barry Halper Collection where it was lot 1912. 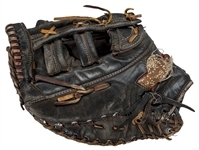 There was a letter (not included with this piece) that Buckner wrote to Halper which sums up its place in history "This glove has too many holes in it!". 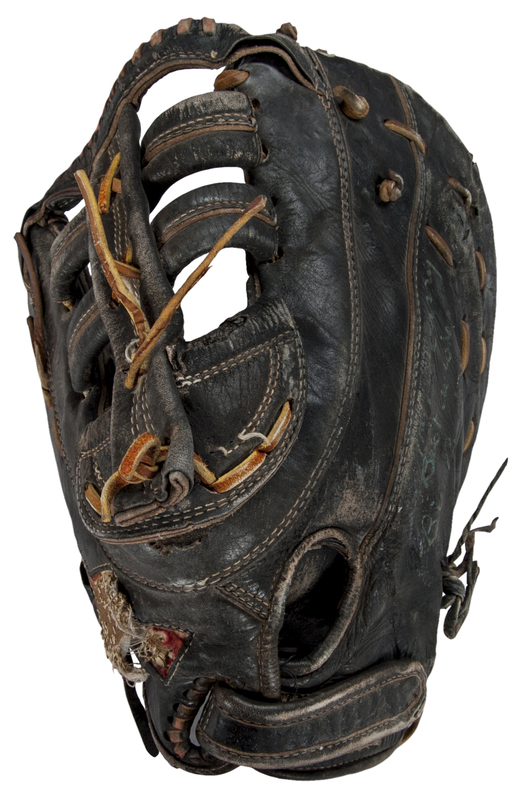 It goes without saying that this is one of the most significant pieces of game used equipment from any World Series, and certainly the only one which is remember for what it didn't do. 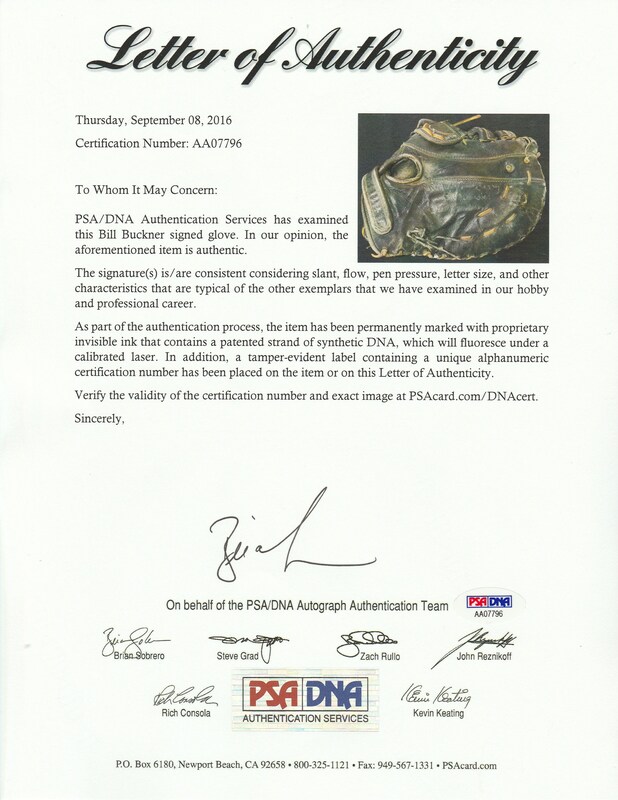 The artifact of World Series history comes with a letter of authenticity from PSA/DNA (1G00312). Auction closed on Sunday, October 30, 2016.